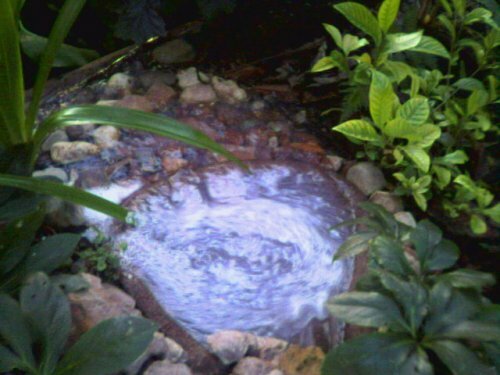 Council of Elrond » LotR News & Information » Incorporating a Small Pond into a Grey Water Diversion! Home » Crafts » The Last Homely Housebuilder » Incorporating a Small Pond into a Grey Water Diversion! Incorporating a Small Pond into a Grey Water Diversion! I modified one of my grey water diversions the other day (the bath water) as the old one was no longer effective due to tree roots blocking the agri-pipe. This time I decided I wanted to make a feature of it, as well as avoiding more tree root blockages. So I decided I would incorporate a small pond into the system. The basic principle behind the grey water diversion, is to use the waste water from the house to water the garden, in this case the bath water. This water normally just goes down the drain, into the river system, and eventually out to sea. By diverting it to water a garden bed, it does this job, before eventually seeping into the gutters, flowing down the drain, into the river system, and eventually out to sea. As we use only glycerine and vegetable base soaps and shampoos, this does not pose a chemical risk to any of the organisms in the garden whether micro or macroscopic. the old system involved redirecting the bath water via buried pipes into a loop of agri-pipe (90mm diameter black polypipe with drainage perforations) at the top of a gently sloping garden bed. When the bath is drained, the water flows underground through the regular pipes into the agri-pipe where it seeps into the soil, thus watering the plants. Even if the water is still hot, the passage through he pipes acts as a cooling system, further enhanced as it seeps through into the soil. This method has worked well for nearly 10 years until about six months ago when I noticed the bath taking much longer to drain. As the garden bed it waters contains most of my fruit trees, and it has been exceptionally dry the last few years I theorised that the tree roots had entered the perforated agri-pipe and mostly blocked the flow of water. So the last few months the water has just flowed across the path and onto the garden. Very messy. it reaches the pond. So it is a win – win situation. An effective waste water irrigation system for my fruit trees, which is also a water feature. I knew that old pond would eventually come in handy.